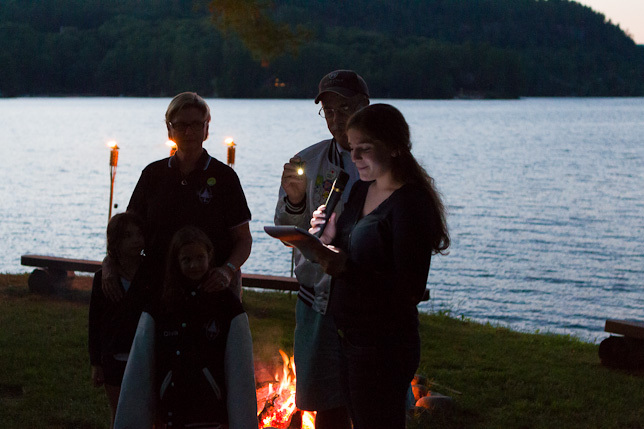 Tonight the camp gathered around the campfire and honored the campers and staff who have spent five or more summers at Point O’Pines. We were so excited to give special gifts to such a large number of campers and staff this year. There were some moving speeches, memories and even songs shared by the campers. As is our tradition, two of our youngest campers, the “Tiger Tis,” tried on the nine year jacket that was presented tonight to Peaker Olivia. Wow, what a great nine years it has been! Congratulations to all.